Designing the perfect room starts with choosing the right elements. 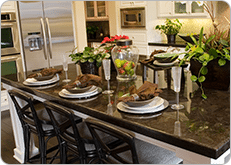 The countertop manufactueres at Formatop offer a wide variety of colors, patterns and design flexibility that acrylic and quartz surfacing products offer. Our services are catered to clients throughout San Jose, Santa Cruz, Santa Rosa, Concord, Monterey, San Francisco, Oakland, Livermore and surrounding areas of Northern California. 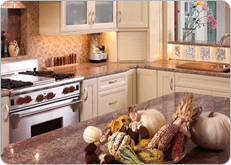 We guarantee the durability, easy maintenance and cleanup that make these products ideal for any kitchen or bath. Formatop provides excellent turnaround on all acrylic and quartz surfacing needs. They offer a full line of products including Corian, Zodiaq, HI-MACS, Viatera, Silestone and similar brands in a price range to meet your budget. All of these products carry a ten-year warranty. We pride ourselves on having 100% customer satisfaction. 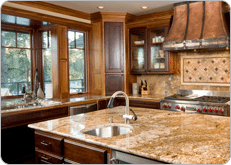 Also available is a full line of plastic laminate custom countertops including Formica, Wilsonart and maple butcher block products. Formatop welcomes the opportunity to become your one-stop counter top shop. Formatop, located in Campbell at 281 McGlincy Lane, phone (408) 377-9000, invites homeowners and builders to consider us when requesting bids. Please call us today for a free estimate.